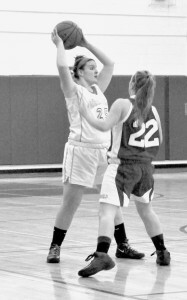 The Lady Horde basketball team scored its highest game yet last Friday in a 52-40 loss to Schuylerville. “Granville came out strong in the first quarter and the only time with the lead, but Schuylerville finished in the fourth with their press,” Coach Jenn Goff said. The end of the first quarter saw Granville up by three at 15-12, but the girls took a back seat to the Horses in the second. The teams tied in the third quarter, but Schuylerville was able to take off in the last eight minutes finishing it at 14-7. “It was a great game. They worked hard and that was the highest score of the season,” Goff said. Gabby Hilder and Amy Baker dominated the net for Granville scoring 13 and 12 points respectively. Schuylerville’s Breanna Miller was her team’s high scorer with 15. The win came a few days after a 77-23 loss to Tamarac. The girls started off enthusiastically in the first quarter but couldn’t quite keep up with the Bengals throughout the rest of the game, despite hard efforts. The first half saw the Horde snatching the ball back from Tamarac over and over, but not quite making contact with the net when they brought it back to their end of the court. Baker and Marissa Brown each got a 3-pointer for Granville, and they were also among the team’s high scorers. Hilder and Brown each got eight points for their team, and Baker added five. The Bengals’ Jenna Erickson had the highest scoring for the game with 22. The Horde is now 0-12 in the league and 0-13 overall. Though the girls won’t be going to sectionals this year, they’ll have a chance to keep up their momentum in a home game against Cambridge tomorrow night at 7:30.